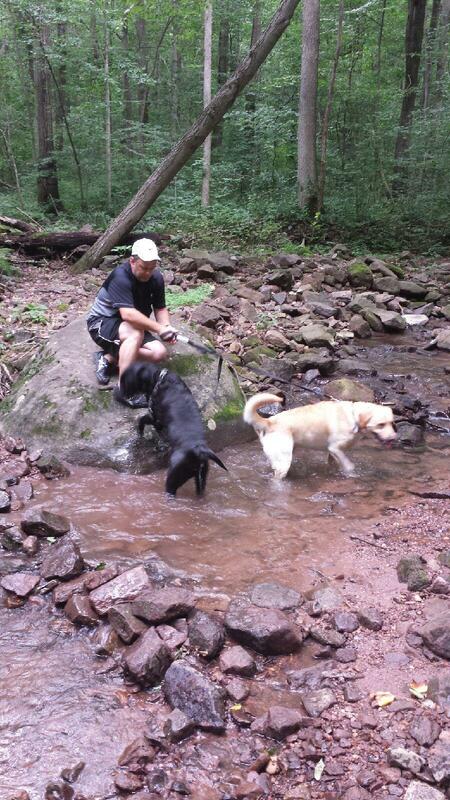 Hiking is a great way to take a breather with your dogs. We have had some beautiful days this summer (and some miserable ones), and we are fortunate to live in an area with a lot of great places to hike. Hiking with your dog can be a wonderfully rewarding (and tiring! A tired dog is a good dog.) way to get some exercise and get a mental break from the endless hubbub of modern life. 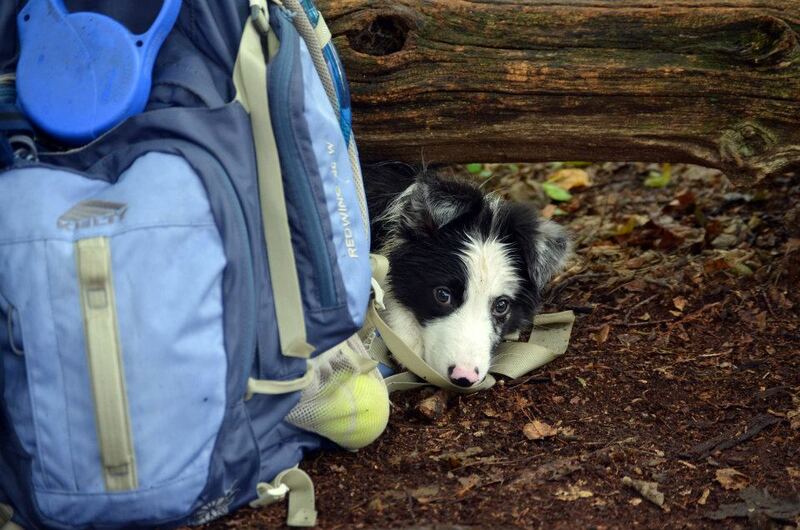 Unfortunately, hiking without being prepared can result in some scary situations. Fortunately, some sensible and easy steps and planning can help you make the most of your outdoor experience with your pup. 1. Consider your dog’s fitness level. Before tackling a long hike, make sure your dog is physically capable of it. Is he overweight? Is he a smush-nosed (brachycephalic) breed? Does he have arthritis? Maybe it is best not to take him along, but instead stick to shorter walks that are more manageable for him until he’s in better shape and the weather is cooler. Dogs with short snouts are especially sensitive to the heat, and can overheat quickly even on days that don’t seem like they’re that hot. If you’re thinking about having your dog carry a backpack, make sure it fits him well. Get him used to carrying weight gradually– don’t load him up if he’s not used to it- it’s a lot more work to hike while carrying a pack! A dog should never carry more than 10% of his weight in a pack, and you should be careful to balance it from side to side so as not to put unequal stress on his body. Other vaccines may also be appropriate, depending on where you’re hiking. We see a lot of Lyme disease in this area (especially Mt. Gretna and Cornwall). Fortunately, there is a fairly effective vaccine that protects against it. Leptospirosis is another disease for which we can vaccinate. Lepto is uncommon around here, but it is out there and it can be passed from dog to human. 3. In line with the Lyme vaccine, please use a flea and tick preventative! Whether you choose a topical product such as Frontline Plus or an oral flea and tick preventative such as Nexgard, it is always going to be your dog’s first defense against Lyme and other tick-borne nasties. Be sure to reapply monthly so that your dog gets the best protection possible. 4. Be sure to carry plenty of water and a bowl for your dog! There are plenty of options out there for lightweight and collapsible bowls that are easy to pack (or even clip on to a backpack). Make sure you have enough water (more than you think you’ll need) for both the humans and the canines. Dehydration can be very dangerous, especially with some of the horribly sticky days we’ve been having. Yes it’s heavy to carry, but it is the most important thing to take with you. 5. Tag that dog! An easily visible and up-to-date id tag (or embroidered collar) is the best way to get your dog home in the case that he gets lost in the woods. Make sure the phone number is current. Microchips make for an awesome backup to an id tag. They cannot be lost or removed, but they do require someone with a scanner in order to get your dog back to you, whereas with an id tag, you eliminate that “middle man”. 6. Carry a first aid kit! This is always a good idea whether you take your dog with you or not. There are a wide assortment of first aid kits available, whether dog or human-specific. You can also make your own. There’s a wonderful post about how to make a tiny first aid kit on the Team Unruly website. I like to make sure I’m carrying Vetwrap (a flexible bandaging material that sticks to itself), a rubber glove, disinfecting wipes, and some kind of non-stick sterile pads. I also carry a bandana with me, which can be useful for everything from bandaging up a wound to muzzling an injured dog who is scared and trying to bite. It can also be soaked in cold water and used to help cool off a hot dog (or human).